The Floor Trader and its family of stores provide you with the widest selection of flooring options, all under one roof. Each product we feature is carefully selected to ensure the latest in design technology, fashion-forward styles, colors, and warranties. When you shop at The Floor Trader, you can be assured that you have the opportunity to make your flooring purchase from collections of recognized name brands and exclusive private brands that are designed to save you even more! 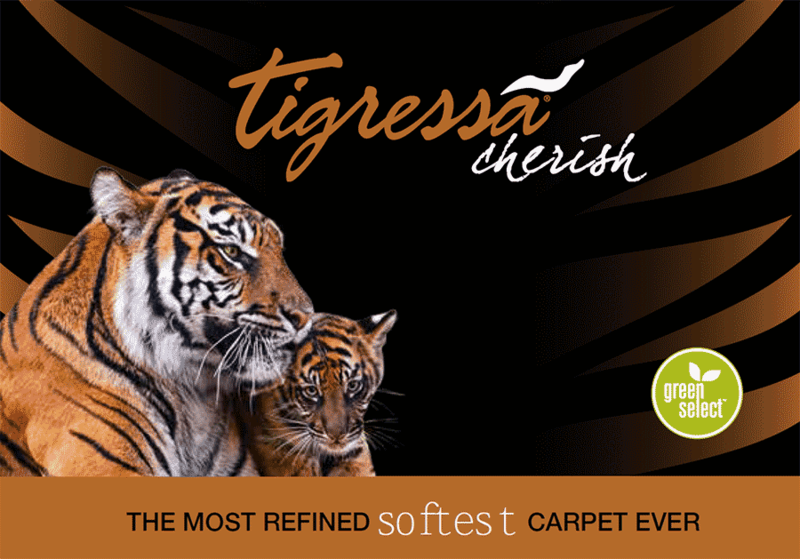 Tigressá Cherish uses the most luxurious nylon fiber available with standards for softness virtually unmatched. Every square inch of carpet is comprised of thousands of microstrands, combining softness and performance for a lifetime of durability. Cherish offers luxurious softness and outstanding strength and durability. This carpet welcomes the beauty of the outdoors and makes it last. The Tigressá Cherish colors are drawn from the natural environment with advanced technology keeping them pure, true and forever fade resistant. Tigressa H2O Innovative backing made with toughness of commercial construction. Nylon carpet fibers are fusion-bonded to the lightweight, flexible backing. Liquids, including pet urine, cannot soak through or absorb into cushion or sub floor. Tigress H2O offers a unique backing which will stand up to pet claws, making it pet and family friendly. Made to withstand high foot traffic with highest density and maximums in fiber twisting, Tigressa also offers a patented advanced soil and stain protection which survives multiple years of hot water extractions. The advanced repel technology cleans and releases stains, no harsh chemicals needed and quickly dissipates household and pet odors within 30 minutes or less. Plus it's environmentally friendly, Tigresa H2O is made from recyclable Nylon 6 and can be recycled again and again making it a viable green option for your home. Featuring a new level of nylon micro-fiber technology, Tigressa SoftStyle is one of the softest fibers available today. This is our premier all-nylon carpet collection featuring a one-of-a-kind blend of softness and strength that outperforms ordinary carpets. Smaller fiber filaments, but more of them in each bundle. More filaments in each fiber bundle add wear resistance so your carpet looks newer longer. Plus, Tigressá is engineered to show less matting and crushing than traditional nylon, so it offers unparalleled performance that will wear better longer. Food, spills, and stains are no match for carpet that features Resista stain protection. Unparalleled spill resistance and advanced stain technology make carpets with Resista the perfect choice for today’s most active households. Engineered to provide performance and durability, Resista carpets actually repel liquids, making clean-up a snap! Plus, Resista features revolutionary warranties for stains, wear, and texture retention. 10-year no exclusion stain warranty against all food and beverages. Up to 10-year limited texture retention warranty. Up to 15-year limited wear warranty. Legendary stain resistance. Lasting performance. Excellent color clarity. And now, a new level of comfort. Introducing Resista Soft Style – a new collection of impossibly soft carpets from the leader in stain protection. Resista Soft Style is the ultimate choice in carpet for today’s active households. The soft, durable and stylish looks of Resista Soft Style carpets add a touch of luxury to any home. Resista Soft Style’s unbeatable stain protection guarantees their lasting value. Live, play and relax with comfort and durability beneath you. Resista Soft Style combines comfort and lasting durability yet soft to the touch with superior protection. No questions asked 90-day replacement warranty. Up to 20-year limited wear warranty. Shop now for Resista and Resista Soft Style or visit us for an in-store demonstration of revolutionary spill resistance and softness. Ciara pre-finished hardwood flooring is manufactured with a Diamond 50 Finish that is performance tested for durability and backed by a 50-year residential warranty. Milled for a precision fit, Ciara is carefully checked to assure less variation in color from board to board. In fact, Ciara hardwood flooring is graded, milled, and quality control inspected to surpass all industry standards. Shop Now for Ciara Premium Hardwood or Visit Us To See the Styles and Colors Available for Your Home! Easy Clic® laminate flooring that interlocks easily for trouble-free installation.. The resilient high-density core of Easy Clic® stands up to heavy foot traffic. Easy Clic® aluminum oxide finish resists dents, fading and stains. Quite simply, you can’t go wrong with Easy Clic® superior performance, outstanding value, ease of installation, and top-of-the-industry warranties. Shop Now for Easy Clic® Laminate or Visit Us To See the Great Styles and Colors Available that You Can Install Yourself ⋯ Today! DynaFlex is a revolutionary new kind of resilient flooring. Imagine a floor that combines the stylish good looks of wood and stone with carefree maintenance and unprecedented durability. Innovative construction makes it superior to traditional vinyl in every way. Its extreme flexibility and layered-cushion construction make it a snap to install and a dream to walk on. In fact, flooring comfort is redefined as DynaFlex cushions every footstep, reduces noise, and adds insulation and warmth to any room. At The Floor Trader® we find the best deals on carpets and floors and pass the savings on to you. We save even more by purchasing huge quantities of the best floors from around world. Along with our exclusive product, our buying power means that our stores can also offer a complete selection of well-known name brand products at very competitive prices. The Floor Trader®, Stone Mountain Flooring Outlet, and GCO Flooring Outlet are individually owned and operated, therefore availability of in-stock products and brand may vary by store location. Please contact your local store for availability.